Another guide to life in Thailand, but not the usual “which bus to catch” and “don’t mess with the servants”, but a hard-cover guide to the everyday, but oft unfathomable, life and times in Thailand. 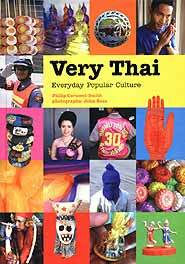 Written by Philip Cornwel-Smith, a writer with much experience in this country, and photographed by John Goss, Very Thai - Everyday Popular Culture (ISBN 974-9863-00-3) was published this year by River Books in Bangkok. In Alex Kerr’s preface to the book, he writes, “A hundred things which had intrigued me for decades became clear on reading it (the book). Such as where the statue of the beckoning lady came from, or why the alphabet always appears with pictures.” That introduction alone was, for me, the ‘beckoning lady’ to look further! Let’s begin with the beckoning lady who is called Nang Kwak, and her overseas cousin, the Japanese Maneki-Neko, the beckoning cat. Page 165 will unravel this mystery, and even extend this into the shamanic practices of carrying certain herbs as love amulets. Have you ever wondered about discarded spirit houses? I always have, and on page 184, it is covered. The attraction in this book is the liberal use of excellent photographs in conjunction with Cornwel-Smith’s well researched words. There are ‘amazing’ facts within the covers, including such bizarre items as a temple in Bangkok which has a gold sculpture of David Beckham in its altar. It appears that even Buddhism became caught up in the football frenzy, in this particular temple at least! The book is divided into four general sections - Street, Personal, Ritual and Sanuk. Each main section is then divided into around 20 items under the general umbrella. I found this a trifle confusing at times, feeling that perhaps an alphabetic approach could have been easier, but this is a minor complaint, as there is a good alphabetic index at the back. The book has also managed to highlight and explain many of the ‘everyday’ features of life in Thailand, to which the expat eye becomes inured after a while, but which still have most interesting stories. For example, the street cats with the knobbly truncated tails have not all had their appendages caught in the door, as I had always imagined. It is a genetic deformity! A fact that was noted by the eminent Charles Darwin, but was missed by me. Even the ubiquitous motorcycle taxis (“motercy”) are explored in depth. Were you aware that the collecting point was known as a ‘win’ and the jackets are ‘seua win’? These jackets cost anything between 4,000-100,000 baht, like a regular taxi license in the west, but are part of the underground economy in Thailand. This continues despite a government heralded national registration policy in 2003. The book has a Bibliography and an extensive Index, which alone would make for good reason to be published in hard-cover. It is also a reference book, no matter how beguiling are Cornwel-Smith’s words or attractive Goss’s photographs. A reference book that will also delight the casual reader, local expat or frequent visitor. At B. 995, this is a treasure-trove that should be on your shopping list. So, with “Nutz Live Cutz”, their last album with A & M Records, languishing in the bargain bins of record shops, and A & M holding a further 2 years recording contract over the band, the future was not exactly rosy. Keyboard player Kenny Newton left to form Nightwing, who carried on with their own brand of Bombastic rock until 1984. The only way that the remaining nucleus of the band could stay together and see out their two years of contract was to sing for their supper at the Ship Hotel in the Jersey Isles. So for two summer seasons these scouse boys entertained the holiday makers on those sunny tax free isles. But then fate took another turn. Geoff Appleby, well-known record producer and long time admirer of the band, hearing of their plight and seeing a change in the music scene with Punk bands being replaced by a return to the harder more refined days of yore (bands like Iron Maiden and Samson were making the waves in London), invited the band up to London for a showcase gig at the Greyhound in Croydon. The band hit the stage at 8.30 p.m. to a packed hall and were still playing when the house lights came up, having been called back to encore so many times that the crowd had 2 versions of “Wall Banger”, 2 versions of “Sinner”, and a new song called “Bootliggers”. Britain’s number one heavy metal D.J. Neal Kay was in the crowd. He was putting together an album of tracks from all of London’s up and coming new bands. The album was actually complete, but Kay held release of the album and asked Nutz to quickly record their new track “Bootligger”, and then added it on to his new album titled “The New Wave Of Heavy Metal”. The album was a smash hit and opened a whole new genre of hard rock. The newly formed Carrera Records were the lucky label to get their signatures to have a second stab at that elusive stardom. Carrera promised the world to the boys. New clothes were bought and a new image designed (lots of leather and bright colours) with more emphasis on David Lloyd as the front man with his mane of red hair and movie star looks. Studio time was booked and the band given as much time as they needed to put down an album as they wanted. At this point a name change was thought to be a good idea (whether it was or not, who knows?). So after the years of frustration behind them, the title of “Rage” was decided to be very apt, and suitable for the times. Carrera Records were not a big company and I believe they did the best publicity wise for the first album “Out Of Control”. It was also given a five star rating by the new tome of Heavy Metal “Kerrang”. “Out Of Control” is a perfect hard rock party album with every song being pressed along at full speed with a constant beat running through proceedings. The guitar solo on the opening track leaves you in no doubt that Mick Devonport had lost none of his chops during his sojourn in the Jersey Isles. The single from the album “She’s On Fire” went straight to number one on the Bandwagon Heavy Metal chart. David Lloyd’s vocals put him at the top of the pile. A showcase gig was set up at the world famous Marquee club in London and immediately sold out, so another second date was arranged. In the audience were members of “Iron Maiden”, “Def Leppard”, and “Judas Priest”, all coming to see how this hard rockin heavy metal is done by the big boys. Needless to say the concert was a huge success with perhaps “Thank That Women” from the “Out Of Control” album being the high point.